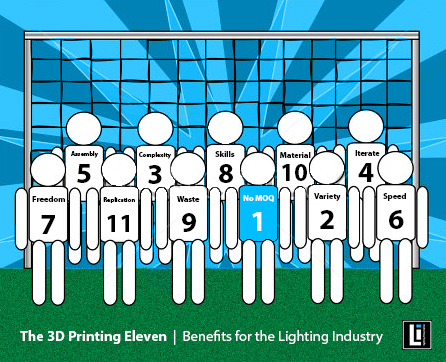 Today, the adoption of 3D printing as a “potentially new” manufacturing standard is growing rapidly. Designers and engineers around the globe are discovering the new and unique advantages of the digital process for their latest projects. Generally, 3D printing is set to change the way we make almost everything. A great manufacturing change is irreversible going to happen in the lighting industry as well, commonly known as a quit “conventional” industry from its origin. This “new way of making things” also opens up a new design space in lighting. Functional prototypes of lighting components or even entire fixtures can be printed straight from a designer’s computer. It’s become a matter of “just” conversing a 3D Computer Aided Design (CAD) file into real parts by pushing the ‘print’ button: in one step from CAD-to-Product. 3D printing technology has been around for a many years already, but actual developments and further cost reductions mean it is becoming much more commonplace now. This time around – as opposed to 25+ years ago – the 3D-printing (short: 3DP) industry seems to be on solid ground, establishing itself as a serious and useful tool to the design process. Ancillary products, such as materials, 3D scanners, and increasingly, software solutions are undergoing minor changes that will provide solid support for 3D printing equipment. The arrival of 3D printing – also known as additive manufacturing (short: AM) – has given designers even greater freedom and flexibility to create new and easy customizable products. In the wake of 3D printing, mass production is no longer necessary for economic viability. Goods which were previously produced in the Far East may now be produced locally. As a result of this, shipping movements can be reduced, as well as storage of goods, along with handling and distribution costs. Users now have more choice about the shape, complexity and size of elements, and are able to make small iterations to the design without significantly altering production costs. With the start of the 21st century, we have entered a new digital era. The digital age of industrial manufacturing has started. Various industries, such as the printing industry (offset to digital printing) and the music industry (compact discs to digital music files) succesfully went digital, along with others. ‘Getting digital’ comes with new or enhanced opportunities, and even greater flexibility and freedom in design, without the usual time and expenses needed, a huge lack in todays manufacturing landscape. The barriers that have held conventional manufacturing technologies back from further enhancements and evolution, most dominant the constraints of off-line tooling parts, are gone now. Enabling and supporting software solutions are expected to further speed up and empower the development and adoption of 3D printing. Marketing lighting products is all about speed, a most powerful tool to set yourself apart from the competition. 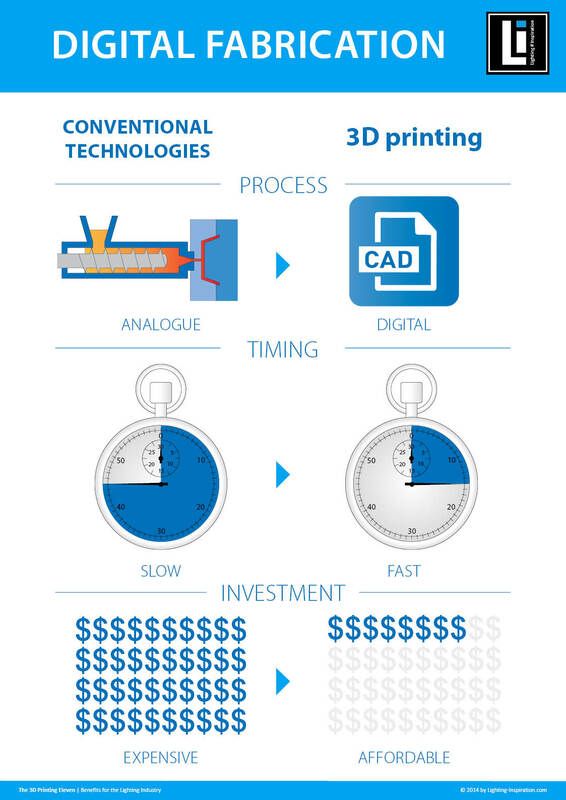 With the coming of 3D printing, long lead times are amazingly shortened and they definitively belongs to the past. Digitally 3D printed products are now available around the globe in as fast as a few days. Thanks to the digital process, including the upfront design and manufacturing, it has become possible now to design and manufacture unique lighting fixtures in a couple of days. Since there’s no tooling involved anymore, waiting times can be reduced significantly and keeping stock is no longer necessary for affordable pricing or fast deliveries. Products are available upon request with “on-demand” deliveries with the printed goods covering the exact demand. Both large and small lighting firms can fully unlock the potential and benefits now of this new way of making. It’s not a matter of having a strong financial backup to cover large upfront invesments anymore. No longer the ‘big’ eating the ‘small’. It’s getting more about the ‘fast’ eating the ‘slow’. Instead of mass production, 3D printing emphasizes customization. Until now, limitations in traditional technologies such as extrusion and injection molding, have dominated lighting manufacturing and prevented the customization of lighting solutions. It forced engineers and specifiers to work with standard “off-the-shelve” products. Digital 3D printing technologies enable its users to customize their approach since they can easily shape contemporary lighting products. In an industry where most of the materials necessary for lighting fixtures can be produced using a 3D printer, it will also revolutionize the way in which lighting is used. A new generation of architects and designers is approaching lighting from a new perspective. The mindset that different spaces should be lit in the same way by using a simple ‘blueprint’ is being challenged. Lighting specifiers are increasingly examining the importance of using light in different ways. 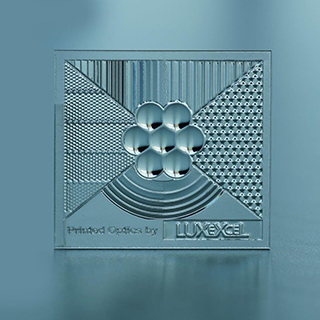 With a rising demand for custom designs, the focus is no longer solely on the development of LEDs with a higher output (lm/watt) or lower wattage. Lighting is no longer simply functional: it’s being used in an emotional, engaging and personal way to create the right mood or ambiance. Lighting has become a quality way of living instead of “just a necessary tool” for living and working environments. The goals are now changing to create comfortable, user-friendly, glare-free, and uniform lighting systems meeting specific demand. On top of this, the emotional role that light plays in the construction of a space or situation is becoming ever more significant. Light has an amazing ability to influence us, to change our mood, our feelings, awareness or even our thoughts. Lighting specifiers – as advocates of ‘experience-based’ lighting solutions – are shouting for customizable lighting products to help them create emotionally charged environments. Average production badges are moving down from hundreds into tens of pieces, and the average supply chain ‘s becoming much more challenged due to the many diverse products that flow through it. No extraordinary upfront investments in tooling and inventory and ordering only one part as easy as ordering plenty. Apart from the printer itself, 3D printing only requires a digital CAD file and some raw materials to create an infinite variety of shapes. Printing a complex design is no more expensive than printing a simple one. Creating and manufacturing multiple product variations is one, making sure they perfectly fit the needs is two. Fully assembled end products and significantly reduce of labor, handling, supply and shipping cost. Products readily available: printed “on demand”, ready while you wait. Availability of shapes that were never possible before when using traditional manufacturing methods. 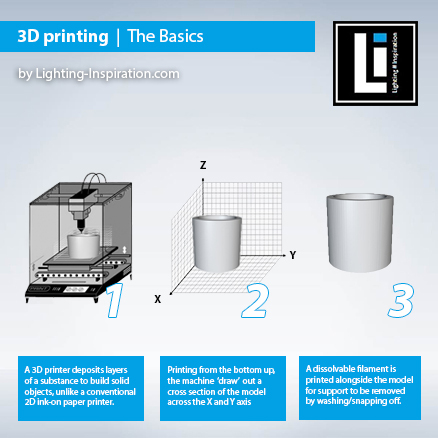 Operating a 3D printer requires less skilled operators than conventional ways of manufacturing. Depending on the materials involved, 3D printing significantly reduce when compared to traditional machining methods. Blending and mixing-up different kinds of raw materials into a single product is now possible in new ways with 3D printing. Digital 3D modeling allows unlimited copying of designs without loss of quality, regardless of how many times the object is being printed. Will 3D printing change everything?